Ramen is truly global when it reaches beautiful Lopez Island - part of the San Juan island chain near Seattle in the Pacific Northwest. With roughly 2000 residents in 30 square miles, and only accessible by ferry or seaplane, Lopez harkens back to a world where you grow your own food, swap furniture with neighbors, and the north and south parts of the island play pranks on each other for April Fool's Day. The island has no traffic lights and only a half dozen restaurants - most of which are casual bakeries and ice cream shops. Recently I had the pleasure of visiting Setsunai, a newly opened ramen shop in Lopez Village. If you're looking for traditional ramen with rich tonkotsu broth, Setsunai is not it. 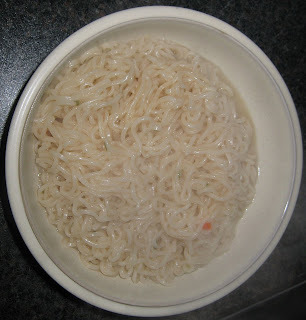 However, what you will get is a truly delightful noodle bowl, made with love and the flavors of the Pacific Northwest. The setting is pure Lopez Island - wooden picnic tables, mason jars, bus your own dishes, and virtually no signage in a galvanized metal structure. The menu is simple. Ramen, udon, or soba noodle bowls - and because it's the Pacific Northwest, even a gluten free rice ramen option. The chef and owner, Josh Ratza, has his roots in pickling, fermentation, and pepper sauces - and you'll see these influences throughout the menu. Let's start with the good. The noodles are absolutely amazing. Handmade, chewy, fresh, perfectly sizes, they are the foundation for a delicious ramen bowl and Setsunai nails it. Served in a light dashi broth on a hot summer's day, I could taste the earthiness of the local mushrooms, the saltiness of the ocean, and the freshness of the noodles. To be fair to ramen lovers though, I'd probably call this "fusion" instead of ramen. Setsunai serves its bowls with spinach instead of nori, pork shoulder instead of chashu, and white boiled eggs. The addition of the fermented cabbage dominates the flavor of the otherwise light and balanced broth, however, it also brings much needed dimension to a pretty tame interpretation of what's traditionally a rich and hearty bowl. Overall I really enjoyed the ramen at Setsunai. Even though it's not a traditional ramen, it was perfectly interpreted with local ingredients and for the local population - and a delightful lunch. A wonderful place to enjoy freshmade noodles and the delicious broth, and a very welcome addition to the culinary scene on Lopez Island. Setsunai, 45 Eads Lane, Lopez Village. Open Thursday - Monday, 11 AM - 4 PM. Alvin eating ramen at the top of Blackcomb Mountain! It's been years since we've updated this blog! But yes, the Lin family still eats ramen. Here's Alvin eating a bowl of fresh ramen at Rendezvous on Blackcomb Mountain in Canada. Despite the very similar names, this pack of noodles is not to be confused with Unif Tung-I Instant Artificial Spicy Beef Noodles. I suppose that most people remember the colors and decorations of the packaging and are unlikely to be confused. I didn't realize how similar the names are until I typed them up. I would never get these two confused since their packaging is so different. Even though these noodles are not indicated as being spicy, they do have a mild spiciness. 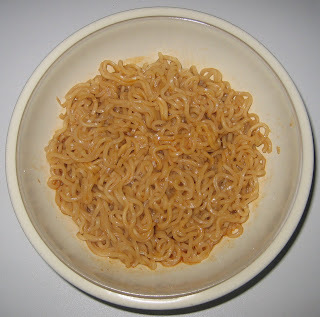 In fact, the broth is nearly identical to the Tung-I Instant Artificial Spicy Beef Flavor Noodles. I think they use the same seasoning oil, but you get a smaller packet in this version. 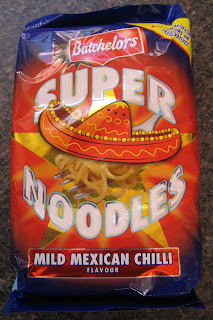 The noodles themselves are very delicious in this pack. They are quite thin and soft, yet packed with nutty deliciousness. I was very happy to find that these noodles do not contain any imitation beef. The textured vegetable protein that ramen manufacturers use to simulate beef never tastes good. 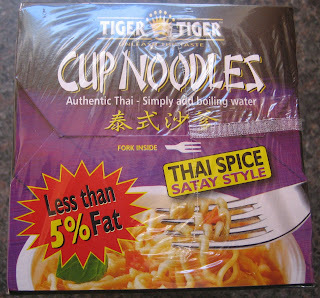 This pack makes a decent bowl of noodles and I give it the edge over its TVP-filled cousin. The packaging for these noodles has changed subtly since 2006. It appears that Unif is now producing and distributing these noodles for Tung-I. On the back of the package, I was surprised to see that this pack originated from Vietnam rather than Taiwan. The theme and graphics for the wrapper haven't changed much, so these are still very recognizable based on the crazy cow and red and white striped borders. The flavor of these noodles is very nice. The broth is intense with beef flavor and has a high oil content. It is quite peppery as well. The texture of the noodles is not as deeply fried as before, but the noodles are thin and pretty flavorful. I was disappointed that these noodles no longer contain bits of carrot like they used to. That was one of my favorite parts previously. This pack also now contains chunks of textured vegetable protein, which I always detest in my noodles. The flavor of these noodles is still very nice, but the overall quality has unfortunately slipped a little bit. I am still happy to eat these once in a while, but probably not as often as I used to. It's not a very good sign when your instant noodle packaging is semi-transparent and you can see the flavor sachet through the outside wrapper. Nevertheless, I took my chances with this one. This is part of Asda's Smart Price range. Similar to Tesco Value or Sainsbury's Basics lines, the Asda Smart Price range is a low cost line of products. The packaging is restricted to one or two colors to reduce cost as much as possible. These noodles were disappointingly limp and tasteless. 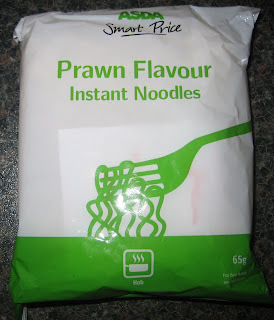 The noodles themselves were quite gooey and starchy and didn't have the springiness illustrated on the packaging. There was barely any flavoring at all, especially not prawn flavoring. It tasted like a weak salt broth. These noodles were terrible, but luckily my expectations were already very low. They didn't taste bad, but there was just no taste or texture to them. I will definitely not be getting these again. One thing that I love about Super Noodles is that they sometimes have very festive packaging. This package makes you feel like you are in a Mexican cantina, enjoying an ice cold margarita and some delicious tacos al pastor. From a practical point of view, the brightly colored packaging grabs your eye in the supermarket aisle and makes you just a little bit more likely to try this flavor out. Upon my first bite, I was expecting strong flavors of cumin, chili, onion, and garlic. While all of these flavors were indeed there, they were quite mild. 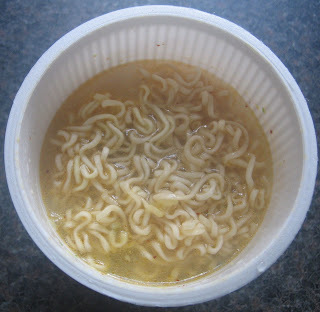 Looking at the picture of the noodles, you can tell that the flavoring is not as strong as it could be. 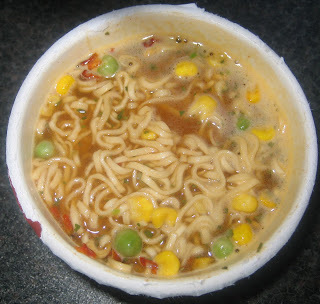 As usual, the Super Noodles themselves are quite high quality. They have just the right amount of inherent flavor and springy texture needed without being bland or soggy. I thought that these noodles were pretty good, but I wished that they had kicked up the flavor a few notches. I guess I should have placed more emphasis on the word "Mild" on the package rather than focusing on the wildly festive sombrero. 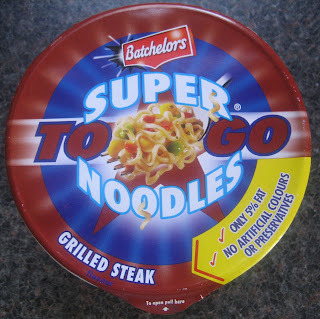 While I did enjoy these noodles, I probably won't be getting them again as there was nothing particularly great about them. There was no way I could resist this pack of noodles with its catchy slogan: "Unleash the Taste". Knowing that there was a fork inside, I could barely contain my excitement as I ripped open the box to discover...a cheap plastic cup inside. Why couldn't they just sell the cup like every other brand does? I guess they feel the need to add some additional useless packaging in order to stand out from the crowd. I love a good satay, but these noodles didn't resemble satay in the slightest. The soup seemed to contain corn starch or some other thickening agent because it quickly became one gluey and starchy mess. The taste was quite bland and didn't have much good flavor at all. It is very rare that I am tempted to throw away a partially eaten instant noodle, but in this case I was strongly tempted to do so. Nevertheless, I forged on for the sake of this review. There is nothing good to say about these noodles except that they have attractive packaging. I will definitely be avoiding anything of the Tiger Tiger brand in the future. Oh yeah, I almost forgot to mention this: the fork inside was pathetically small and completely unusable.